Elizabeth McBride is the author of Wholehearty, a blog on which she shares essays about parenting, faith, writing, and my own journey towards trying to live a wholehearted life. Elizabeth is a friend and client of Valerie Hunt’s and recently used Valerie’s training expertise through LiftHeavyRunLong.com. I enjoyed this article and I think that you will as well. It’s the end of April and no one has any time, me included. There are kids’ baseball games, piano recitals, spring festivals, and school projects seem to pop up constantly. Work is in full-swing and everyone is making their summer plans. There is a lot of activity and a great deal of chaos. Free time is hard to come by. But you can still keep up with your training. I promise. The beauty of the LHRL® method of training is that it doesn’t require a lot of long runs, which are great but require a lot of time. Time that you don’t have. This is an ideal perfect week. Stuff comes up, so it’s not like I follow this perfectly, but this is the MOST I would do in a week. And it adds up to about five hours of training in a week. If you are even considering running a marathon or reading this blog post for that matter, you probably work out five hours a week already. 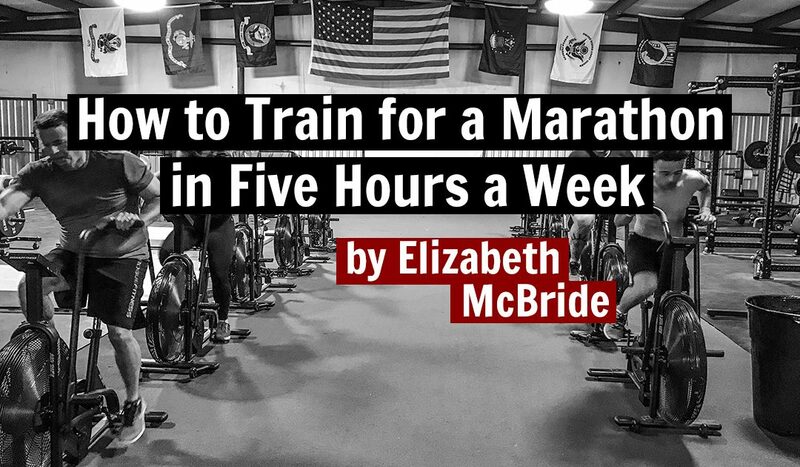 So maybe for you, training for a marathon just requires you to shift how you use those five hours. The first time I ran a marathon I trained the traditional way that most people think of. I ran, and ran, and ran and then ran some more. By the time the marathon rolled around, I was TIRED. And my body felt broken down. The second time I trained I had become familiar with the Pose Method and had started adding some strength training to my workouts. I asked RunRx to create a training plan for me and I was shocked at how minimal the running was as compared to what I had done before. I must admit I worried that I wouldn’t be prepared to run 26.2 miles if I wasn’t killing myself with mileage during training. The opposite was true. By strengthening my body and doing speed work, I was giving my body the tools I needed to run further and faster without putting it through all those grueling miles day after day. I went into the second marathon feeling strong and fit–the opposite of broken down. And I ran that marathon a lot faster and felt great all the way to the finish line. If you are considering training for a marathon, or a half-marathon, or a Spartan race, etc., but think you don’t have time. Think again! It may not take any more time than you are already dedicating to working out. It may just be how you use the time that makes the difference. Want to get started? Try out one of the LHRL® Programs or have Valerie Hunt design a custom program specifically for you. For real, they will create it for YOU. For example, LHRL® made me a plan that includes all of the races I am already signed up for this fall and winter, meaning I can count those as part of my workouts! I don’t know about you, but I  when I can cross two items off my list at once! Contact Valerie Hunt at the address Valerie@liftheavyrunlong.com today.